For more than thirty years, the Cuban state has concentrated its attention and resources on the development of the portion of the agricultural sector under its direct control, neglecting the portion outside its control, particularly private farmers and, to a lesser extent, cooperatives. 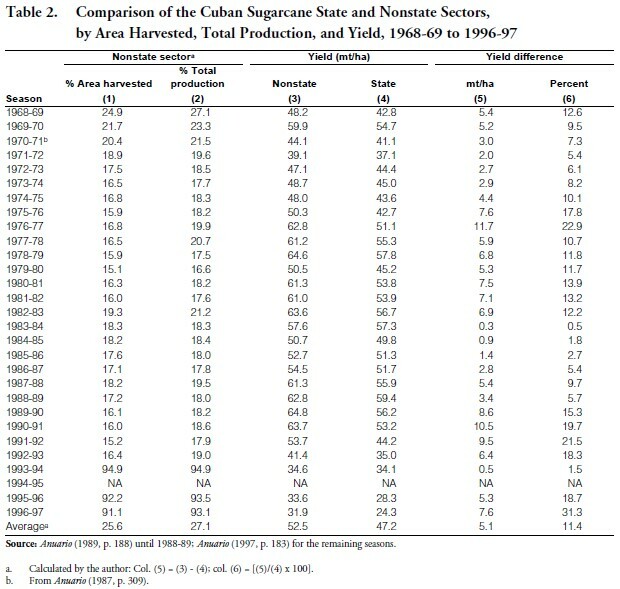 Although comparative studies of agricultural productivity in the state and nonstate sectors that would show differences in the efficiency of resource allocation between them should be a priority among those devoted to research on the Cuban agricultural sector, the reality is that very few such studies have been carried out. Those by Rodríguez (1987), Forster (1989), Deere and Meurs (1992), and Deere, Meurs and Pérez (1992), were carried out with different conceptual frameworks and covered different periods of time.1 The studies by Puerta and Alvarez (1993) and Alvarez and Puerta (1994), however, used a consistent methodology for estimating agricultural productivity in the state and nonstate sectors for the years 1970, 1975, and 1977-89, and for several crops including sugarcane, tubers and roots (potato, boniato, malanga), vegetables (tomato, onion, pepper), cereals (rice, corn), beans, and tobacco. The changes since 1990 resulting from the Special Period in Time of Peace (September 1990) and the breakup of the state monopoly on land (1993), make it essential to update the previous research, to investigate whether the relative productivity of the state and nonstate agricultural sectors estimated for the 1980s still holds in the 1990s. The recent publication of official Cuban economic statistics for the 1990s makes it feasible to do so. Thus, the purpose of this paper is to estimate agricultural productivity for the state and nonstate sectors of the Cuban economy in the 1990s and to compare them with findings from previous periods. • farms managed by the Work Youth Army (Ejército Juvenil del Trabajo, EJT), or by the Ministry of Interior (MININT), the local organizations of Popular Power (Organismos Locales del Poder Popular, OLPP), and by other state entities. The breakup of the state monopoly on land in 1993 changed drastically the distribution of agricultural land. At the end of 1997, the state accounted for 33.42% of total agricultural land and the nonstate sector for the remaining 66.58% (Table 1). Our central hypothesis is that as state intervention over agricultural production units decreases, the quantity and quality of output increases despite a decreasing access to factors of production and other resources. 3 In a previous study, the analysis was based on the contribution of the nonstate sector to total production from its share of planted area, and the total production per planted area—a proxy for missing yield data in all crops except sugarcane (Alvarez and Puerta, 1994, p. 1666). Starting in 1990, official data have improved. Thus, the analysis of the performance of the nonstate sector in this study is based on its contribution to total production from its share of harvested (not planted) area, and the respective yields. No proxy for yield is used. The study period is 1990-97, except for sugarcane, for which it is 1969- 97. We conduct the analysis for more-perishable commodities (i.e., vegetables); for less-perishable commodities (i.e., tubers and roots, cereals, and beans); and for intermediate commodities such as sugarcane, which needs to be processed in the state mills, and tobacco. The specific hypotheses derive from the assumed scale of preferences of nonstate farmers: onfarm consumption → barter → black market sales. The acopio quota is not included at the beginning of the scale because it is not considered a “preference” but a way for farmers to gain limited access to inputs (Alvarez and Puerta, 1994, pp. 1666, 1674). In the current study, black market sales have been expanded to include sales in the agricultural markets established in 1994. 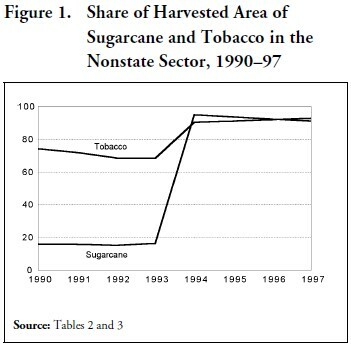 Sugarcane and tobacco share some characteristics: (a) both are important export crops; (b) they have received special attention from state managers and technicians; and (c) since they need further processing, they are not likely to be consumed in significant quantities by nonstate producers on the farm or sold privately in large amounts outside the official distribution channels. Sugarcane was analyzed for the seasons 1968-69 through 1996-97, or 28 seasons (data for 1994-95 are not available), including those in the previous study because of the consistency in data reporting (Table 2). Nonstate farmers outproduced state farmers in each of the 28 seasons: while accounting for an average of 25.6% of the sugarcane area harvested, they produced an annual average of 27.1% of total sugarcane output. Yield differences ranged from 0.3 mt/ha in 1983-84 (representing a 0.5% higher average yield) to 11.7 mt/ha in 1976-77 (which translates into a 22.9% higher average yield). The annual average yields were 52.5 mt/ha and 47.2 mt/ha for nonstate and state farms, respectively. Annual average differences were 5.1 mt/ha higher for the nonstate sector, or 11.4%. A one-way analysis of variance (ANOVA) resulted in both yields being significantly different at P<0.05. Tobacco presents a similar picture. From 1990 through 1997, the nonstate sector accounted for an annual average of 81.2% of the area harvested, but was responsible for 83.1% of average annual production. Average annual yields for the nonstate sector were 0.63 mt/ha, compared with 0.58 mt/ha for the state sector (Table 3). Despite the obvious annual yield differences, the ANOVA did not return any statistical significance (P≤0.32) between the two sectors. The data in Tables 2 and 3 reflect the breakup of the state monopoly on land in 1993 to create the UBPCs (see Figure 1). Starting with the 1993-94 season, sugarcane area harvested in the nonstate sector jumped from 16.4% to almost 95% (Table 2). In the case of tobacco, the corresponding figures are 68.4% for 1993 and 90.3% in 1994 (Table 3). Despite the disruptions resulting from that drastic change, and the lack of complete autonomy of the newly created cooperatives, agricultural productivity in the nonstate sector continues to be higher than in the state sector in these two important crops. The Special Period, and the establishment of the UBPCs, did not change the results of the previous study with respect to sugarcane and tobacco. The vegetables studied are tomato, onion and pepper. The period of examination is 1990-97. With regard to these commodities, nonstate farmers should perform better than state farmers because these commodities have to be moved quickly to the state’s refrigeration facilities, thus avoiding large quantities devoted to on-farm consumption, bartering, and sales in the black market. • Tomato statistics show an identical average annual share of 59% in both area harvested and share of total production for the state and nonstate sectors (Table 4), reflecting very close yields in the two sectors: 5.73 mt/ha and 5.65 mt/ha average per year, respectively. As expected, the ANOVA result indicated a lack of statistical significance (P≤0.87) between yields of the two sectors. • For onions, while nonstate farmers were responsible on average for 56.6% of the area harvested, they contributed an annual average of 59.6% of total average production. Average annual yields in the state sector were 3.90 mt/ha, surpassed by the nonstate sector with 4.59 mt/ha per year. Despite this difference, no statistical significance (P≤0.25) was indicated in the ANOVA results. • Pepper statistics also present a more favorable picture for nonstate than for state farmers (Table 4). Nonstate sector producers accounted for an average 72.5% of area harvested but produced an average of 79.9% of total pepper output. State farmers averaged 4.54 mt/ha per annum, while nonstate farmers averaged 6.85 mt/ha. The ANOVA results (P<0.01) confirmed the previous statement. 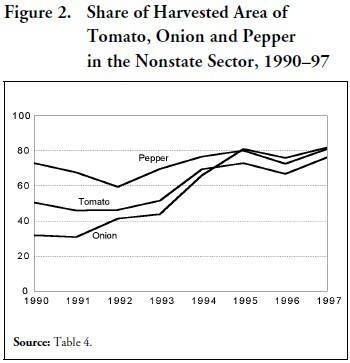 Area harvested by the nonstate sector in the last years shows identical trends for the three vegetables (Figure 2). Although starting from different levels (31.9%, 50.5%, and 73% for onion, tomato and pepper, respectively) the upward trend associated with the establishment of the UBPCs brought the share of land under nonstate sector control to about 80% for the three crops in the last year of the period under study. The results support strongly our hypothesis with regard to vegetables. Except for tomatoes, where yields were about equal for both sectors, it corroborates our previous findings. The results for tomatoes may be explained by the creation of the free agricultural markets in 1994, which may force nonstate farmers to report additional quantities produced and intended for sale in these markets. This would be an important addition to the farmers’ scale of preferences discussed above. The ratios of sales over production before and after the creation of the agricultural markets cannot be calculated because of lack of data. In this study, tubers and roots include potato, boniato and malanga; cereals include only rice and corn. Beans are also considered as a less-perishable commodity. • As in the previous study, potato is the only crop in the tubers and roots category where average annual share of production (37.9%) for the nonstate sector is larger than average area harvested per year (37.3%). The difference, however, is extremely small. Average annual yield in the state sector was 17.4 mt/ha, while the nonstate sector shows a slightly higher average of 17.9 mt/ha/ year (Table 5). An extremely small yield difference produced non-significant statistical results (P≤0.85) in the ANOVA. • For boniato, the nonstate sector harvested on average 48.1% of annual area, while producing 46.4% average of total output per year. State sector yields averaged 3.4 mt/ha, while the corresponding figure for the nonstate sector was 3.1 mt/ha (Table 5). The ANOVA result indicates a very low (P≤0.16) level of statistical significance. • Malanga shows more drastic differences: 68.9% average annual area harvested by the nonstate sector contrasted with 57.6% annual average share of total production. Average annual yields of 3.0 mt/ha for the state sector contrast with a much lower 1.8 mt/ha per year for the nonstate sector (Table 5). A high level of statistical significance (P<0.01) by the ANOVA confirmed the yield differences between both sectors. Trends in shares of area harvested for the three crops are somewhat different (Figure 3). 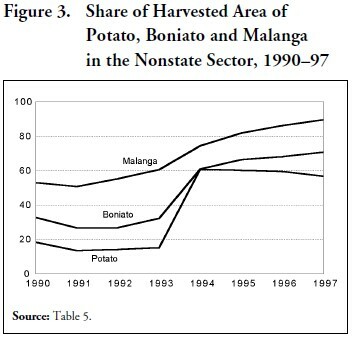 Malanga shows the highest percentage of area harvested, followed by boniato and, finally, potato. The big jump also occurred from 1993 to 1994 as a result of the establishment of the UBPCs. The results from the analyses of tubers and roots corroborate the results of the previous study and give credibility to the hypothesis stated for this type of less-perishable crops, namely that since these crops do not spoil soon after harvest, nonstate farmers can hide them from Acopio for on-farm consumption, bartering, or sales in the black market. Malanga presents the most convincing case. As stated previously. The case of malanga, which reflects the poorest performance, may validate the previous explanation. The demand for this commodity is higher than for the other tubers and roots. Benjamin, Collins and Scott (1986) call malanga “the starchy tuber most Cubans love” while stating that “Cubans consider [malanga] the ideal weaning food.” This commodity, however, is not legally available to the general population since it is “allocated through rationing primarily to groups with special diets—small children, the elderly, people with digestive problems, for example” (Alvarez and Puerta, 1994, pp. 1667-8). • In the case of rice, the nonstate sector controlled 32.3% of area harvested in the nonstate sector and accounted for a yearly average of 30.5% of total production. Average annual yields in the state sector were 2.60 mt/ha, while the nonstate sector reported 2.34 mt/ha. As expected, no statistical significance (P<0.40) between yields in both sectors was found in the ANOVA. • For corn, the nonstate sector had annual average area harvested of 63.0%, contrasting with an average share of total production of 56.6%. Average yields in the state sector were 1.10 mt/ha, while they were 0.85 mt/ha for the nonstate sector (Table 6). ANOVA results rendered a high statistical significance (P≤0.05) for yield differences between the state and nonstate sectors. • For beans, the nonstate sector accounted for 53.3% of area harvested and obtained 43.6% of total production. Annual yields in the state sector were 0.29 mt/ha, while the figure for the nonstate sector was 0.19 mt/ha (Table 6). High statistical significance (P≤0.01) was returned by the ANOVA. Figure 4 shows the increase in shares of area harvested by the nonstate sector since 1994. In 1990, at the beginning of the study period, the shares of agricultural land devoted to rice, corn and beans were 13.2%, 49.3% and 40.0%, respectively. 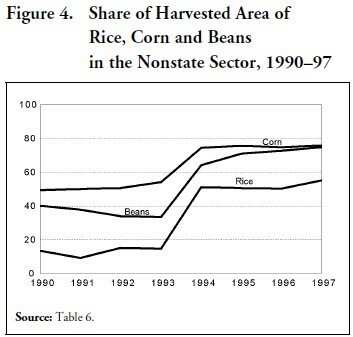 By 1997, the influence of the nonstate sector in these three commodities translated into shares of area harvested of 55.0%, 75.8% and 74.6% for rice, corn and beans, respectively. As stated at the beginning of this paper, the establishment of the Special Period in September 1990 has to be considered when analyzing differences in agricultural productivity between the state and nonstate sectors. The reason is that government policy may have influenced the results because it distributed already scarce resources unevenly between the state and nonstate sectors. To elucidate this issue, the data were analyzed in a different manner. Yields for the year 1990 were considered the starting point. An average of the remaining years (1991 through 1997) was computed. This average was intended to capture the variation in yield of selected crops over several years. The negative or positive impact was calculated as the percentage change compared to the base year (1990). The results are shown in Table 7. Starting with the intermediate commodities, it is not surprising that, given the dismal performance of the sugar industry since the beginning of the 1990s, sugarcane yields dropped by 33.4% in the nonstate sector and by 35.0% in the state sector. Tobacco yields decreased by 13.9% and by 10.9% in the nonstate and state sectors, respectively. 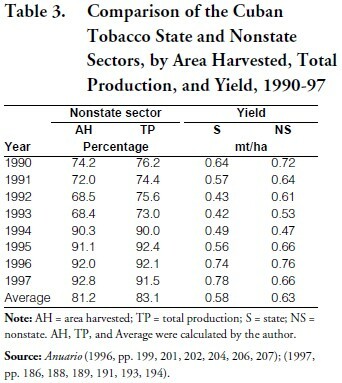 On the surface, these data seem to contradict the relative success experienced by the tobacco industry in recent years.4 The yield increases of the last years of the study period (from 1995 to 1997) could not compensate for the drop between 1991 and 1994 in both sectors (Table 3). Vegetables present mixed results. There were increases in yields for tomatoes and onions but a decrease for pepper in both sectors. Tomatoes experienced an increase of 3.3% in the nonstate sector and of 14.8% in the state sector while yields for onions rose by 19.0% and 25.4% for the nonstate and state sectors, respectively. Yields of pepper, however, decreased in both the nonstate and state sectors, by 35.7% and 4.8%, respectively. The sharp decrease in pepper yield may result from an abnormally high yield in the base year (1990). In general, increases in vegetable production during the Special Period can be attributed to the extra attention given to these crops to supply the tourist sector. Mixed results are also present in the case of tubers and roots. Potatoes show tremendous yield increases in both sectors: 47.2% in the nonstate sector and 53.0% in the state sector. The very high increase may be affected by the opposite of the phenomenon observed for pepper: an abnormally low yield for potatoes in the base year. Boniato yields declined by similar percentages in both sectors: by 9.4% in the nonstate sector and by 8.3% in the state sector. Malanga yields showed an 8.8% decrease in the nonstate sector and a much-higher 42.3% in the state sector. The yields in the starting year are also responsible for this discrepancy: the state sector started with yields more than twice those in the nonstate sector. This relates to the hypothesis and the assumed scale of preferences for farmers discussed throughout the paper. For cereals, while rice yields experienced a decrease of 7.2% in the nonstate sector, they dropped by 19.7% in the state sector. In addition to yield differences at the beginning of the study period, another possible explanation for the differences in behavior is the increase in yields experienced by the nonstate sector after the establishment of the UBPCs. These organizations have more governmental support than dispersed farmers. Recall that the former rice farms were part of the rice agro-industrial complexes (as UBPCs continue to be), with all the benefits derived from that association. Corn yields rose by 27.5% in the nonstate sector and by 5.7% in the state sector, probably due to the same reasons explained in the case of rice, except for the lack of agro-industrial complexes. For beans, yields in the nonstate sector were three times lower than for the state sector during the base year; this difference explains to a large extent the increase of 66.7% in yield for the nonstate sector compared to a decrease of 11.1% for the state sector. • Results from testing the general and specific hypotheses for intermediate, more-perishable and less-perishable crops, based on the scale of preferences assumed for nonstate farmers, are positive and very convincing in every case. • The results also corroborate those in a previous study (Alvarez and Puerta, 1994). Even in the presence of new, and potentially disruptive, events such as the breakup of the state monopoly on land, the establishment of the UBPCs, and the creation of the agricultural markets, the same results were obtained. The stability of the results in the face of new data for different time periods enhances the credibility of the theoretical and methodological framework developed to analyze differences in agricultural productivity between Cuba’s state and nonstate sectors. • The Special Period in Time of Peace, imposed in September 1990, has had different impacts on yields of the state and nonsate sectors depending on the commodity. Yields decreased in both sectors for sugarcane, tobacco, pepper, boniato, malanga, and in beans for the state sector. The remaining commodities showed from modest to significant yield increases. • The radical transformation of the Cuban countryside after the breakup of the state monopoly on land and the establishment of the UBPCs was obvious in the change in relative shares of area harvested and total production between the state and nonstate sectors after 1993. 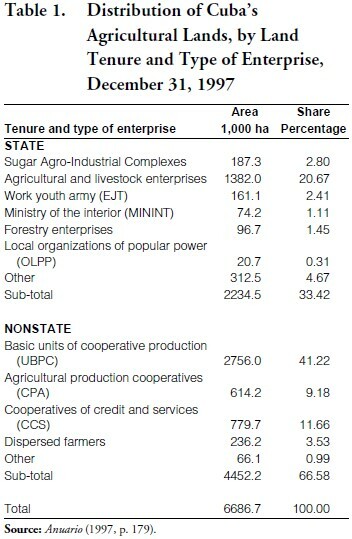 The area harvested by the nonstate sector in the last year for which official statistics are available (1997) was as follows: 91.1% of sugarcane, 92.8% of tobacco, 76.3% of tomatoes, 81.9% of onions, 81.1% of peppers, 56.7% of potatoes, 70.7% of boniato, 89.4% of malanga, 55.0% of rice, 75.8% of corn, and 74.6% of beans. Alvarez, José. “Comments on ‘The Cuban Cigar Industry as the Transition Approaches’ by Joseph M. Perry, Louis A. Woods, Stephen L. Shapiro and Jeffrey W. Steagall.” Cuba in Transition— Volume 8. Washington: Association for the Study of the Cuban Economy, 1998, pp. 426- 428. Alvarez, José and Ricardo A. Puerta. “State Intervention in Cuban Agriculture: Impact on Organization and Performance,” World Development, 22:11 (1994), pp. 1663-1675. Anuario Estadístico de Cuba. La Habana: Oficina Nacional de Estadísticas, various issues. Benjamin, Medea, Joseph Collins and Michael Scott. No Free Lunch: Food & Revolution in Cuba Today. New York: Grove Press, 1986. Deere, Carmen Diana and Mieke Meurs. “Markets, Markets Everywhere? Understanding the Cuban Anomaly,” World Development, 20:6 (1992), pp. 825-839. Deere, Carmen Diana, Mieke Meurs and Niurka Pérez. “Toward a Periodization of the Cuban Collectivization Process: Changing Incentives and Peasant Response,” Cuban Studies, 22 (1992), pp. 115-149. Forster, Nancy. “Cuban Agricultural Productivity,” in I.L. Horowitz (Ed.) Cuban Communism. New Brunswick, N.J.: Transaction Publishers, 1989, pp. 235-255. Perry, Joseph M., Louis A. Woods, Stephen L. Shapiro and Jeffrey W. Steagall. “The Cuban Cigar Industry as the Transition Approaches.” Cuba in Transition—Volume 8. Washington: Association for the Study of the Cuban Economy, 1998, pp. 414-425. Puerta, Ricardo A. and José Alvarez. “Organization and Performance of Cuban Agriculture at Different Levels of State Intervention,” Cuba in Transition—Volume 3. Washington: Association for the Study of the Cuban Economy, 1993, pp. 91-122. Rodríguez, José Luis. “Agricultural Policy and Development in Cuba,” in A. Zimbalist (Ed.) Cuba’s Socialist Economy Toward the 1990s. Boulder: Lynne Rienner Publishers, 1987, pp. 25-41. Sáez, Héctor R. Property Regimes, Technology, and Environmental Degradation in Cuban Agriculture, Ph.D. Dissertation, University of Massachusetts, Amherst, May 1997. 1. A more recent work by Sáez (1997) relates environmental conservation and degradation to type of agricultural organization. The implications for agricultural productivity are indisputable. 2. Dispersed farmers is the name given in the official statistics to those farmers not belonging to any cooperative. Other names found in the literature include nonstate, independent, private farmers, and peasants. 3. The issue of unequal access to productive resources has been discussed at length elsewhere (Puerta and Alvarez, 1993) and not repeated herein. 4. Perry et al. (1998) contain a description and analysis of that relative success. Alvarez (1998) explains briefly the reasons why.